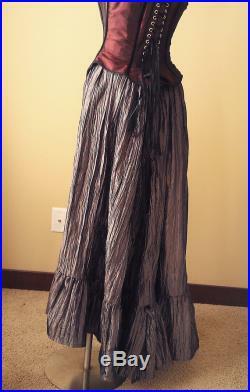 Textured steampunk skirt for fabulous fun in your outfit. 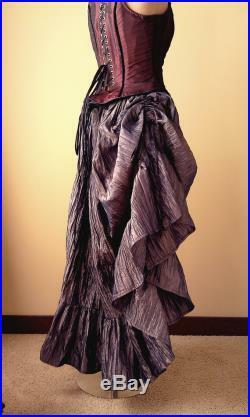 Has bustle pulls on both sides for more wearing options and versatility made from a gorgeous dark, copper taffeta with a lavender undertone. It is gathered more in the back to make it more full and elegant as you walk. You will feel transported back in time when you here the swish of fabric around you. It is a fun and magical feeling. 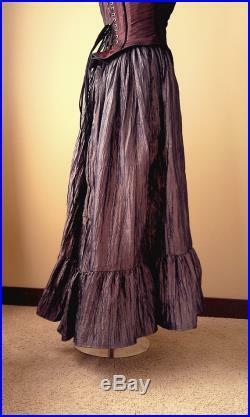 It can either be worn straight or ruffled up at the side with a ribbon that pulls it up for a fun asymmetrical gather. Washing:can be washed gentle cycle in the washer and then hang to dry. Or message us for a custom listing. 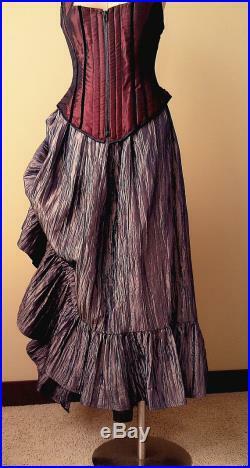 Skirt is absolutely beautiful deep, rich color.